@The Kool Aid Man, hey! I find that offensive. I want my nails to look good while I crash. @Jonathan932, is that male time or female time? "They will also require that every driver drive bra-less with loose clothing and a safety camera be installed on the dash"
It is shvt like this that makes me want to leave this app. Come on guys, I thought this was a great community. But the sexism and the friendzone posts and the constant implications that all girls are terrible and manipulative (especially the attractive ones) or are only worth what their bodies look like is exhausting and depressing. I hate it when I have to scroll past this, a post about the friendzone, stripper jokes, "you skip the flat ones", things like that. If you're all wondering why there are so many forever alone comments here, there's a good chance that's why. Sheesh. @Vulthuryol, curse these sloppy fingers! I'm tired of people hating on NASCAR. I would like to see you drive a car with no gauges, no power steering, no tire grip at 180 mph while being surrounded by 43 other drivers. Good luck trying to keep that 900hp monster on the track with all the turbulent air created by the other cars. NASCAR is currently America's most watched spectator sport. So they must be doing something right. Rant over. @2ndAmendment, in my opinion, NASCAR is just boring. But then again where I live theres a dirt track 10 minutes away from my house. Now that is super fun. 150mph sliding around turns and getting all of two inches from the outside wall. And the turbulence of dirt makes asphault look like the smoothest ride on the planet. 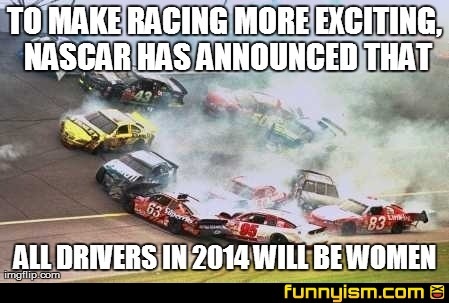 And yet make drivers caused THIS pileup lol. If there is ever an all female race I want in. Any sponsors out there? So did anyone hear about the woman who was shaving her lady parts while driving? @TerraLark, Having drove a race car, albeit on dirt, I can say it is much more fun when you're actually driving. Apparently they got theAsian part is already down.